I suspect they are newish but don't know if they are vintage or recently made. Cannot figure the mark. 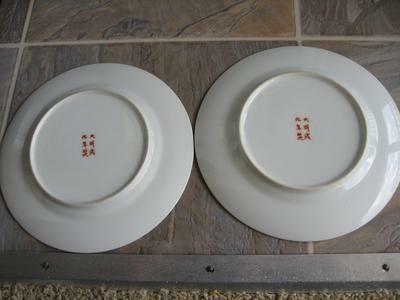 Seems that it is painted or printed underglaze. Which period? Chenghua is Ming dynasty and that is impossible. Please read in the marks section and you will find why marks are unreliable. I have never seen an apocryphal Chenghua mark like this. 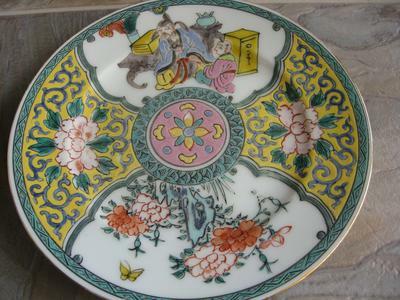 The real period marks looks different, but the thing is that there are scores of antique and newer Japanaese porcelain items with an apocryphal Chenghua mark. 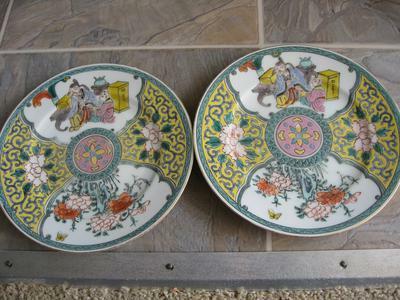 Looking only at the overall impression this plate gives, without going into details, it could be an Arita decoration, but I don't know if yellow ever was used in those. 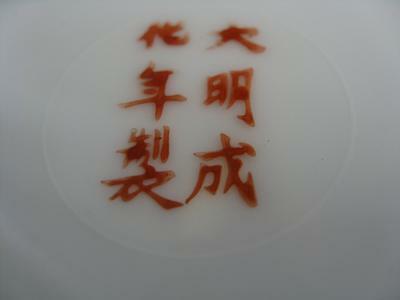 I am not specialized on Japanese porcelain. The rim decoration also looks more Japanese than Chinese. Is the style and the decoration common for the period or they are off? Also, the authentic marks from that period should be blue, right? This has a spurious "Daming Chenghua Nianzhi" mark. The colors and mark are 20th century. Could be Japanese.